One wonders if the conceit behind Carroll Square Gallery’s “Space Is the Place” is meant half-jokingly. The two artists in the show—-Mariah Anne Johnson and John Watson—-were asked to make “site responsive installations,” yet there are probably a dozen galleries in town with more interesting spaces for an artist to be “responsive” to than Carroll Square’s spare, rectangular white box. Still, Johnson and Watson do what they can with the rather antiseptic environs. Johnson reprises her technique of carefully folding and stacking vintage fabrics into sinuously curving forms that hug the walls and perch carefully against a protruding column. Johnson’s fabrics—-stripes, solids, checks and ticking patterns—-gently undulate in both form and color. 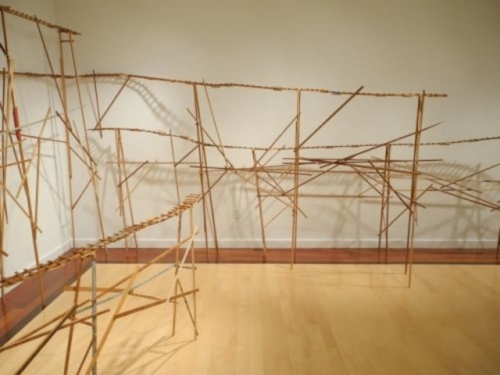 Watson’s installation, by contrast, is the embodiment of rickety—-a series of disconnected train tracks made from reclaimed wood that hover precariously on stilts, suggesting some unholy melding of Lincoln Logs and Coney Island’s Cyclone roller coaster as reimagined by Dr. Seuss. As it turns out, the strongest relationship in the show is not between the installations and the space but rather between the two installations themselves. Unexpectedly, Johnson’s fabrics come off as more solid than Watson’s wood, which looks so fragile that one sneeze could seemingly topple it.